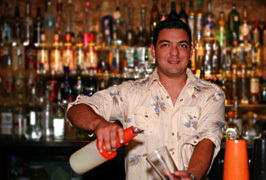 ABC Bartending Schools offers bartending courses in more than 30 locations nationwide. We offer convenient, flexible class schedules and can train you to be a professional bartender in just 40 hours or less! Owner Tony Sylvester is celebrating his 30th year of training and placing bartenders nationwide. The Sylvester family goes back three generations in the hospitality industry. Look at the great cities listed on the left where Tony has opened schools. You may notice that all these cities are hospitality oriented which means lots of restaurants, hotels, country clubs, nightclubs and bars. Think about what it takes to staff these establishments. ABC gradutes face a great opportunity! Read the Sylvester Family History. Read what others have said about ABC Bartending Schools. Watch Bartending Videos at BartenderTV! This is an excellent opportunity for an experienced bartender who's looking for a career position until retirement. Hospitality management history a plus but not a must.